One of the most important parts of making any kind of jewelry are the tools that you use, so it is important that you choose pliers that will work best for you and your projects! To help you pick the perfect pair of pliers I am writing a series of posts about all the different aspects of jewelry making pliers. In this post I will cover handle-to-hand comparison. First of all, the pliers should fit your hand so that they are comfortable to work with. If you are only using a pair of pliers once or twice for a project, then you can get away with something that isn’t sized to your hand. But, if you are making chainmaille, numerous loops, or anything else where the pliers are going to be in your hands for more than a few minutes, you should consider how the handles fit in your hand. Pictured below are two jewelry making individuals, one with small hands(3 inch palm width, 6 1/4 inch total hand length) and one with large hands(3 3/4 inch palm width, 7 7/8 inch total hand length). As you can see, the pliers fit in their hands differently. For our hand models, the longer handles pliers worked better for the larger handed person and the shorter handles worked better for the smaller handed person. When your pliers handles are too short for your hand, the end can dig into your palm over time, creating a painful pressure point. The end of the handle should sit about a fingers width or less from the bottom of your palm, opposite your thumb, for maximum comfort and control. If your plier handles are too long or too widely set, as you can see in the third and fourth set of photos with the small handed person, it can be hand to wrap your fingers around the tool comfortably and cause strain. I like to be able to touch my thumb and forefinger together around the top of my plier handles, it is more comfortable. It also allows you to grasp the piece you are making or pick up new components without setting down your pliers. The same principle can be applied to the handles being to small or too closely set for your hands, as in the second and last photo with the large handed person. The plier nearly disappears into their hand! Along with the handle most likely digging into the palm, the fingers are almost in a fit holding the tool, limiting mobility and increasing strain. So, how can you tell if you have large hands, small hands, or are somewhere in between? Grab a ruler and lay it on your palm from right above your thumb straight across to the spot above the heel of your hand. That measurement is your palm width. Next, line the end of the ruler up with the bottom of your hand and take the measurement to the tip of your middle finger. This is your total hand length. What does all of this mean for you? 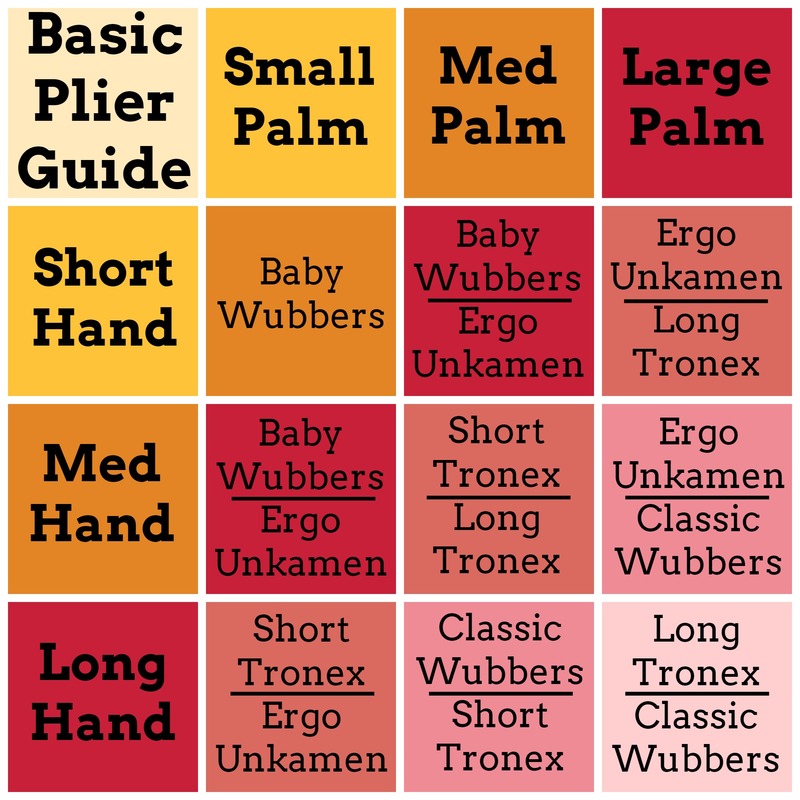 Check out the chart below for a basic guide for my recommendations based on hand size.